Artificial reefs make it all real. The fish. The coral. The adventure. And the savings. The Gulf of Mexico off the coast of Texas hosts commercial and recreational fishing and diving and plays an important role in local economies. It provides vital habitat for marine life of all types and links us with the ocean through an interconnected environment. Artificial reefs enhance this marine environment by providing additional habitat needed by marine life. The Texas Parks and Wildlife Artificial Reef Program, funded through industry partnerships and grants, creates and enhances this critical marine habitat to benefit Texans and the natural environment. Natural tropical coral reef systems are typically found in shallow, warm-water environments where sunlight penetration is high. The Texas Gulf has cooler (temperatures may drop to 60°F during the winter months) and murky waters created by strong currents and inflows carrying sediment. The combination of colder temperatures, freshwater inflows and barren substrate creates a situation in which natural tropical coral reefs typically do not survive, except in few cases.. The Gulf of Mexico is teeming with thousands of species of plants and animals that need hard surfaces to cling to in order to complete their life cycles. Since the Gulf of Mexico has relatively few naturally occurring reefs, man-made structures like those maintained by the Texas Artificial Reef Program give invertebrates such as barnacles, corals, sponges, clams, bryozoans and hydroids the hard surfaces they need to thrive. Energy then flows up the food chain, providing biological growth that creates additional habitat and provides sustenance for snapper, grouper, mackerel, shark and other fish species. 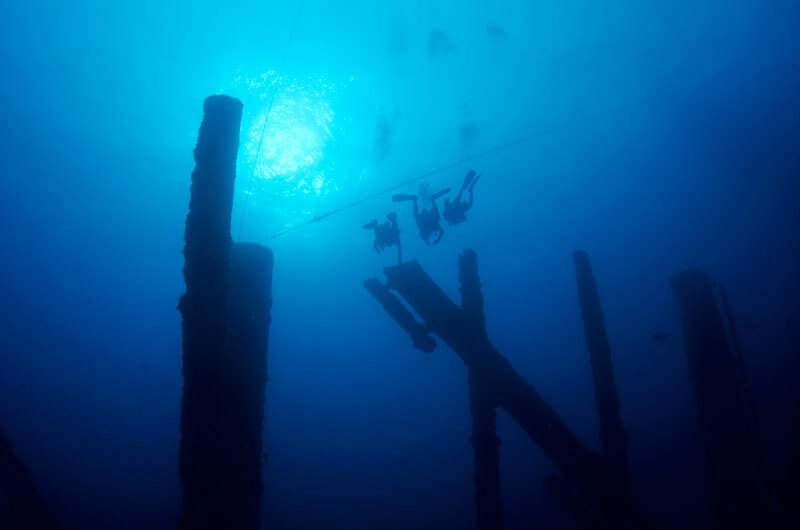 Since artificial reefs become such hotbeds of wildlife, divers and anglers benefit as well. The Texas Parks and Wildlife Department was created in 1963 when the Fish and Oyster Commission (formed in 1895) was merged with the Game Department (formed in 1907). When this new entity was merged with the State Parks Board in 1963, the Coastal Fisheries Division was created in the new agency. The Artificial Reef Program (PDF, 3.2MB), created in 1990 as a program within the Coastal Fisheries Division, promotes, develops, maintains, monitors and enhances the artificial reef potential of Texas offshore waters.